The Bus to the City as it appears in Animal Crossing: City Folk. The Bus to the City (市へのバス, Bus to the City) is a gameplay mechanic from the Animal Crossing universe. 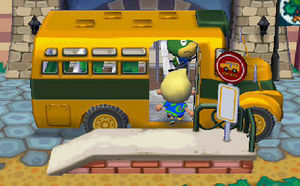 In Animal Crossing: City Folk, the Bus to the City is the means of transportation between the player's town and the city. The bus is ridden by the player at the beginning of the game, and later on can be boarded from the town's Bus Stop to access the businesses and events in the city. The Bus to the City appears in SSB4 in several roles. The Bus to the City can be seen as a background element in Town and City; it is shown traveling with the platforms between the two areas of the stage. However, this does not affect gameplay. The Bus to the City trophy is exclusive to the Wii U version. Trophy of Bus to the City in Super Smash Bros. for Wii U. The bus that takes you into the city in Animal Crossing: City Folk. It's free 24/7 and driven by a certain someone you might recognize (you might have also seen him driving a boat or a taxi). Take the bus anytime to see places like the theatre and the art gallery, and try visiting at night to see some places that are usually closed. In Smash Tour, Bus to the City is a blue item. A player can use Bus to the City at the beginning of a turn to warp all other players to their location on the map. The Bus to the City appears in Ultimate as part of Kapp'n's appearance as an Assist Trophy, in which he drives the bus across the stage and traps opponents it hits inside it. The bus in the background in Town and City. This page was last edited on April 24, 2019, at 19:09.